As part of the collaborative practice brief, Ewan and I have decided to look at the Champney's brief, which intend to raise the awareness of Champneys and our offering among 16-25 year olds. I began to look at who Champneys are, what their aims, morals and ideals are. What they're about. I copied some parts of the brief, where they state who they are, and what they do, and highlighted the important parts. Champneys pioneered the holistic wellbeing concept. We were the first UK health spa chain and the first purpose-built health resort. Champneys boasts four spa resorts located in the English counties of Bedfordshire, Hertfordshire, Leicestershire and Hampshire, each possessing its own style and personality. Our flagship health and wellbeing spas, with their unequalled range of treatments and offerings, attract A-listers, the sporting world, the spa cognoscenti and those who simply seek a treat. Led by our four luxury resort spas, the Champneys experience is also accessible to everyone through the high street Day Spas and the Champneys Spa Collection. Our distinct Champneys brand of Englishness is also growing in Europe, Asia, the Middle East and North America. Owned by mother and son, Dorothy and Stephen Purdew, the Champneys brand began with the purchase of their fourth resort in Tring, Hertfordshire. Purchased along with the Champneys name, the Tring resort was originally owned by the naturopath Stanley Lieff, who in 1925 opened the site as the first UK health farm. The Purdews then went on to rebrand all four resorts under the name Champneys as well as launch the Champneys Collection and eight Champneys Day Spas across the country. Our current target audience is women aged between 35-65. We need you to help us extend this into the younger market, raising 16-25 year olds' awareness of Champneys and what we have to offer in regard to staying healthy, keeping fit and living with vitality. I also looked at the creative challenge which they proposed. The challenge is to find a creative, interesting, relevant and inspiring way to make young adults understand the importance of staying fit and healthy and encourage them to do this through Champneys. It is about suggesting (without being pushing parents!) that they spend their money in a different way - replacing boozy nights out or shopping sprees with a refreshing and invigorating spa break. We would like to make health and wellbeing ‘cool’ amongst young adults, highlighting the importance of staying fit and healthy as well as groomed and gorgeous, to entice a younger target audience to turn to Champneys for all their health and wellbeing needs as well as their pre-party pampering. The chances are this audience may not have even heard of Champneys or they may feel it is not accessible to them. It would be great to educate 16-25 year olds that a trip to Champneys can be much more beneficial than they think. I then decided to look at exactly what Champneys offer, their services and prices. So I can get a rough idea of what I need to work with, and find the appropriate way to market the product. A screen shot of the menu, on their website. It shows their offers, what they do and some specialist options. According to the brief, I'm not allowed to add new things in there, so these are the treatments to which we must work with. It's a fairly broad selection, I imagine we'll end up targeting one or two of them, and using them to push towards our specified audience. I copied one of the prices from the 'Champneys Luxury Spa Day'. Look no further than our luxury day for the ultimate day of pampering and relaxation. Prices from £299.00 per person. *£3 charge applies for advanced class bookings only. A £20 Saturday and Sunday supplement applies. It's quite expensive, although, as far as spa days go, I expect this to be a fairly average pricing. However, the target market which they want to persuade will not be able to afford this, typically. Students, the lucky ones, get £2700 per term, £1600 of this, typically goes on rent, leaving £1100 for food. £300 to students is a lot of money. So, we may have to adjust our aims accordingly. Seeing as the prices are quite dear, and students might not be able to afford on their own, I looked at gift packages. The gift packages allow someone else to purchase the gift package for a friend or family member. The target audience is mainly women, as I saw earlier on. 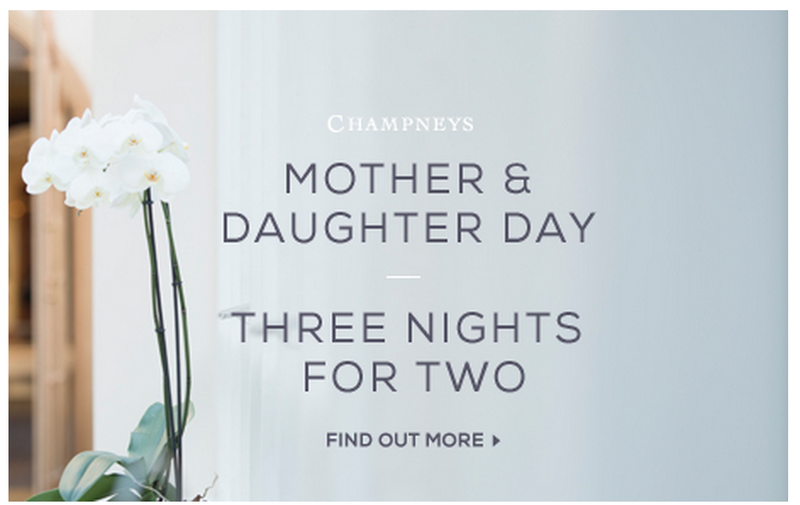 So, I looked to see if Champneys do any packages for mother daughter events, as this would be perfect to raise awareness for the target audience. Luckily, they do. I think I'll use this as a basis to spread out on the brief.